We had a bit of an unusual weekend and decided that instead of kicking off the weekend with pizza night, we would end the weekend with the family’s favorite meal. 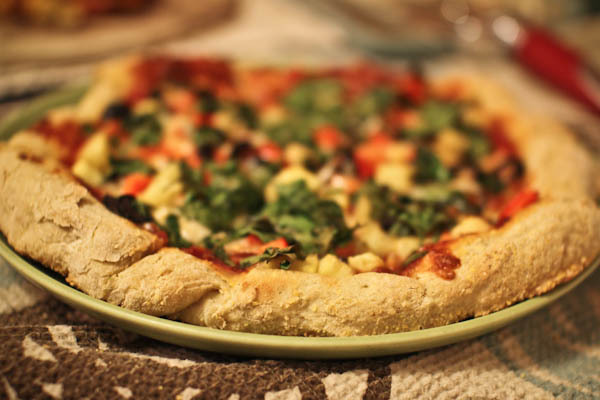 As you know, I have a recipe for an amazing whole wheat pizza crust that I raved about for months. 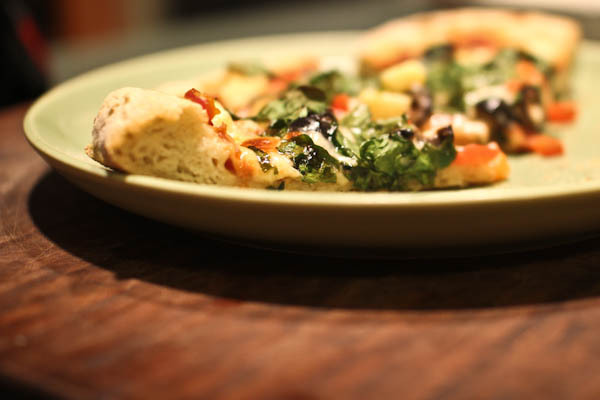 Unfortunately, we are now gluten-free and a couple months ago a search for the perfect gluten-free pizza crust began. I think that we have a winner! 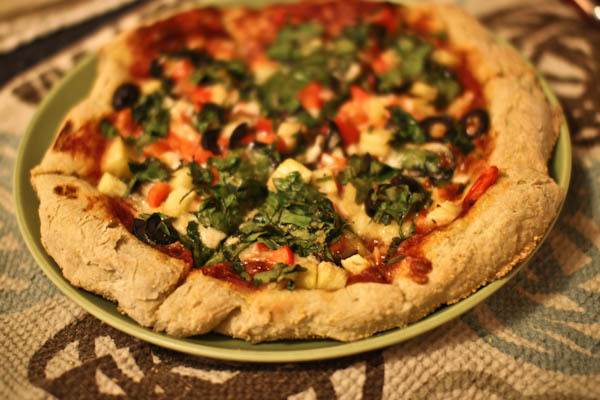 Look at the doughy, perfect crust… Yum! 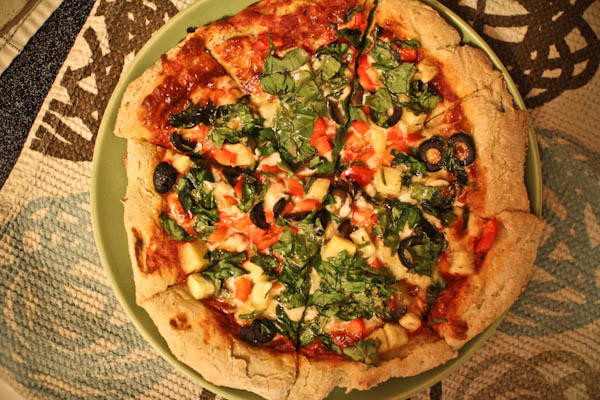 To make this pizza crust, I use a half pound piece of the (mostly) whole grain gluten-free bread dough that I bake for Allan. I found this magnificent bread recipe in the book, Healthy Bread in Five Minutes a Day , which I love. I have made several of the breads from this book, including gluten-free cinnamon rolls using gluten-free brioche dough for Christmas this year. This book is amazing not only for gluten-free bread recipes, but for whole grain varieties, as well. 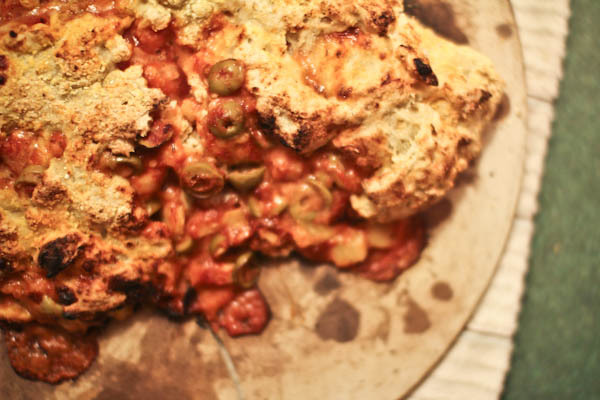 Usually this recipe is a no-fail way for our family to still enjoy pizza night minus gluten. 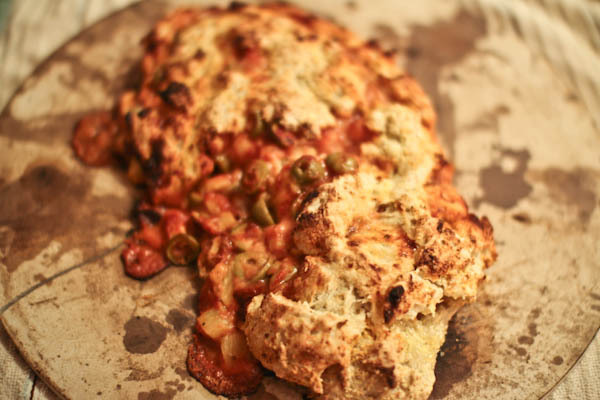 Allan loves a nicely risen, soft pizza dough and a flatbread crust was just not going to cut it for pizza night. I say usually because on Sunday night I had a fail of epic proportions pertaining to Allan’s pizza. When I took the dough out of the fridge and started working with it, I noticed that it felt quite wet. But I didn’t really think any of it. So I continued to form Allan’s pizza on the pizza peel and then place all of the toppings. When I went to remove his pizza from the peel and place it on the preheated pizza stone (at 500˚ no less!) The pizza would not budge. I ran through the scenario in my head… I used enough cornmeal on the peel that it should not be sticking. I couldn’t put my finger on what had gone wrong. So, in an attempt to correct the situation I added more cornmeal and flour to the peel and dough. It still wouldn’t budge. 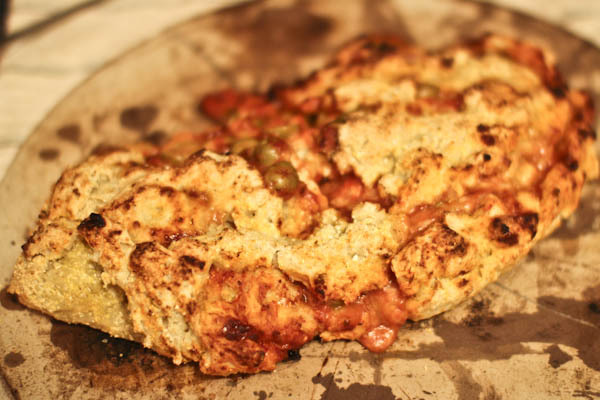 In an act of desperation I folded his pizza over into a calzone and applied even more flour! Eventually after much maneuvering I was able to (finally!) 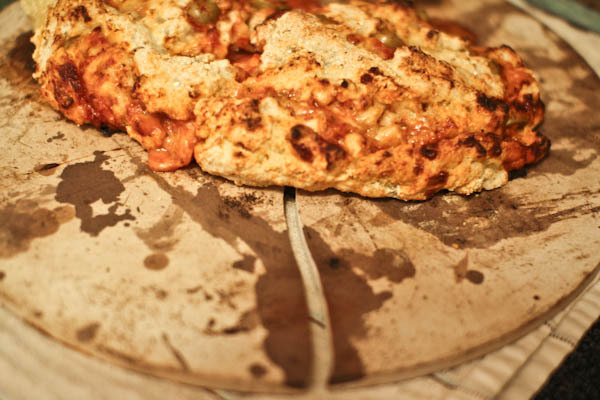 push the now spilling open calzone onto the hot pizza stone. 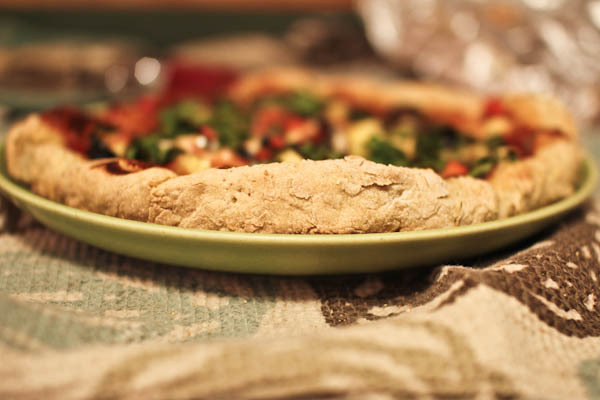 I learned my lesson with Allan’s pizza and applied a TON of brown rice flour to the crust for mine and Matthew’s pizza – which turned out beautifully. Even though Allan’s pizza was ugly, it was still delicious! Both of my pizza stones completely cracked in half! Does anyone know why this happened? My hypothesis is that with all of my distraction with Allan’s pizza sticking to the peel I left the oven door open too long and the pizza stones cooled. When I then shut the oven door and it heated back up to 500˚ it was too sudden of a temperature shift that both stones cracked. I am so sad! Oh well… you win some you lose some. I am off to try a new strength training DVD before the little man wakes up from his nap. I have been trying a few new DVDs lately and hope to write about them sometime soon. Have an amazing rest of your day. Blessings to you and your family! Pizza is seriously one of my most favorite foods. I hate that your pizza stones broke! 🙁 But don’t feel too bad. I’ve had more than one pizza disaster. Once my pizza wouldn’t budge from the stone and we ended up eating a pizza salad. Still tasted good though! Thanks, Lori. I was pretty sad myself, but I still have one stone left. I am debating whether or not to use it for pizza, though.